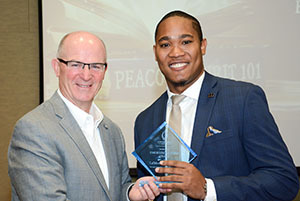 La'Mont Williams ’10, Chicago, Illinois, was presented the Upper Iowa University Emerging Alumni Award by UIU President William R. Duffy (left) during the University’s recent Peacock Spirit 101 Homecoming Alumni and Awards Luncheon in Fayette, Iowa. Upper Iowa University honored five alumni as part of the recent Alumni and Awards Luncheon held during the University’s “Peacock Spirit 101” Homecoming celebration. In addition to paying tribute to the classes of ’47, ’57, ’77, ’92 and ’07, special recognition was provided to the UIU Class of 1967 as its alumni members returned to Fayette Campus for their 50th reunion. Dr. Marcia Anderson became the first woman to enroll in Upper Iowa University’s care and prevention of athletic injuries when she entered the University in 1968. After graduating from UIU in the top 10 of her class, she began her educational career with the Jesup and North Fayette school districts in Iowa. After achieving a master’s degree in physical education at Indiana University, she was appointed as the director of the athletic training program at Bridgewater State College where she served for 25 years. In addition, she was appointed chair of the Department of Movement Arts, Health Promotion & Leisure Studies. Since completing her PhD from the University of Iowa in 1991, Anderson has been the lead author on eight books and chapters¸ authored or co-authored over a dozen professional articles, served as a reviewer for the Journal of Athletic Training, and given over 70 professional presentations nationally and internationally. Anderson joined the National Athletic Trainers’ Association (NATA), which at the time had less than one percent of its membership made up of women. 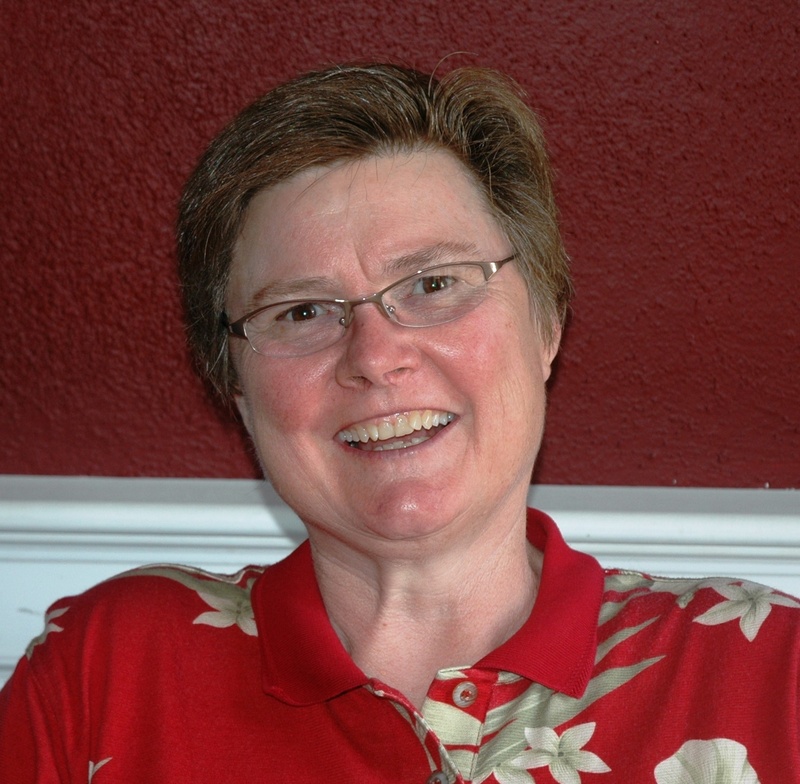 She spent a decade developing questions for the NATA Board of Certification (BOC) exam and was elected by her peers to the BOC Board of Directors, where she served for five years. Anderson was an inaugural inductee into the Hall of Fame of the Athletic Trainers’ of Massachusetts, before being inducted into the NATA Hall of Fame. She was awarded the Presidential Lifetime Achievement in Faculty Research from Bridgewater State University just prior to her retirement in 2011. The 2017 Professional Development Award recipient earned a bachelor’s degree in physical education and biology from UIU. Anderson now resides with her spouse in Norton, Massachusetts, where she continues to be involved in campus activities and professional events. ritable organizations in San Antonio, Texas. He has helped build houses in support of Habitat for Humanity and lead the renovation of a local United Way center that is credited for improving school readiness, academic proficiency and community safety. Bencivenga was a youth sports coach for three years in Germany, serving as both a head coach of youth basketball and as an assistant coach for two soccer teams. He served as a committee chairman for the Ramstein Air Base Elementary School Parent Teacher Association (PTA) and led multiple fundraisers benefitting the lives of the school’s 980 students. While in Germany, he also lead two large scale book drives that raised more than $8,000 to help the school library obtain 210 free books. Senior Master Sergeant Bencivenga entered the U.S. Air Force in 1999. He is currently a cyber systems operations superintendent at Joint Base Langley-Eustis, Virginia. He has served in support of operations Joint Garden, New Dawn and Enduring Freedom. 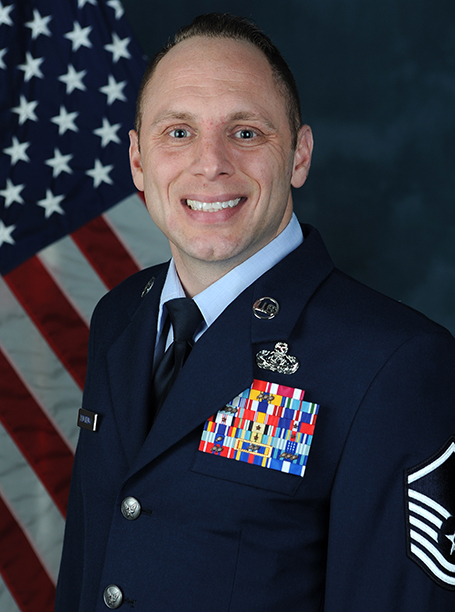 Bencivenga has received the Bronze Star Medal, Meritorious Service Medal, Joint Service Commendation Medal, Air Force Commendation Medal with 3 oaks leaf clusters, Air Force Achievement Medal, and the Military Outstanding Volunteer Service Medal with 1 service star. Bencivenga earned a bachelor’s degree in business administration while attending Upper Iowa University. He and his wife, retired Master Sergeant Josie Bencivenga have been married for 15 years. The couple have two children, Emilee, 14, and Alexander, 10. 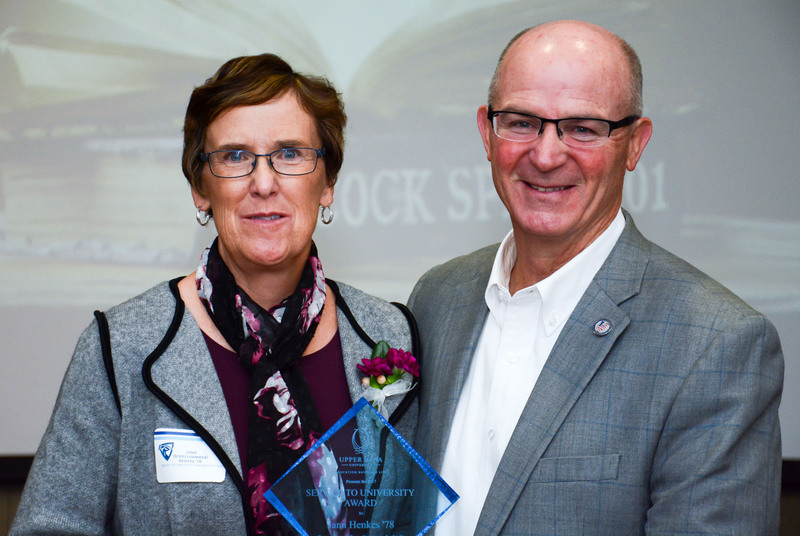 Jann Henkes, Class of 1978, was presented the Upper Iowa University Service to University Award by UIU President William R. Duffy during the University’s recent Peacock Spirit 101 Homecoming Alumni and Awards Luncheon. Jann Henkes is an Alumni Office volunteer and currently serves as UIU Alumni Association secretary. She is recognized for her tremendous involvement with UIU activities, attending and even hosting alumni events, and cheering on the Peacocks whenever the athletic teams are playing near her residences in Apple Valley, Minnesota, or New Port Richey, Florida. Henkes also makes numerous trips to Fayette Campus throughout the fall and winter seasons to cheer on the wrestling and football teams. With a 21-year giving history to University programs, Henkes is a member of the Donor Club program, and UIU Heritage and Loyalty societies. Her donations have helped benefit the Annual Fund, President’s Home, Peacock athletic programs, School of Science and Mathematics, Churbuck Dean’s Fund, Andres Center for Business and Education and general scholarships. Henkes earned a bachelor’s degree in biology while attending UIU. She was employed in the human resources administration field with The QC Group, Inc., and GP Companies, Inc., before retiring in 2013. Michael Knight enlisted in the Air Force on April 4, 1968. After receiving basic training at Lackland Air Force Base, San Antonio, Texas, he received advanced training on aircraft maintenance at Sheppard Air Force Base, Wichita Falls, Texas. He was later stationed at Forbes Air Force Base in Topeka Kansas, before being deployed to Danang Air Force Base in Vietnam in September 1969. 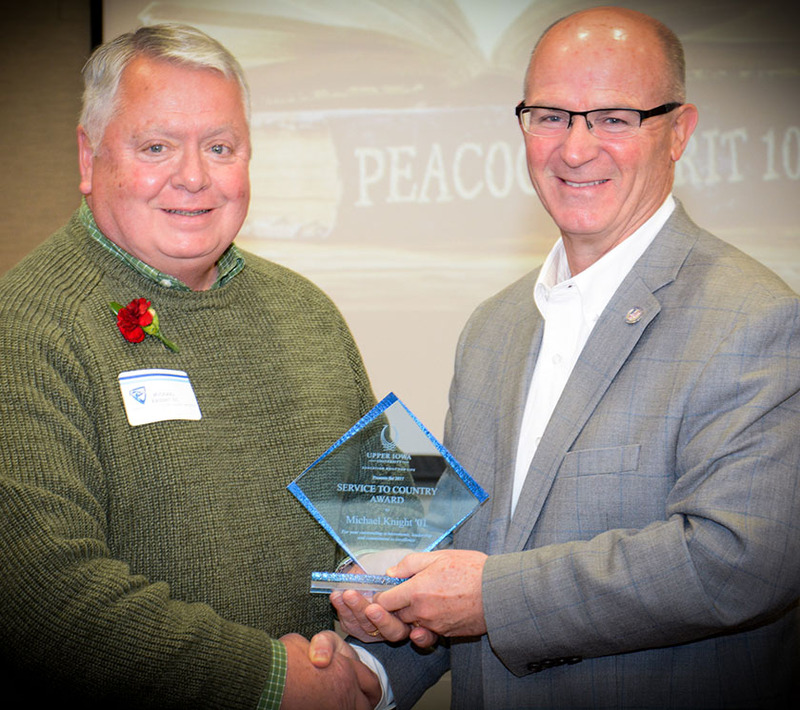 Michael Knight ’01, Urbandale, Iowa, was presented the Upper Iowa University Service to Country Award by UIU President William R. Duffy (right) during the University’s recent Peacock Spirit 101 Homecoming Alumni and Awards Luncheon. After serving in Vietnam, Knight was stationed at Travis Air Force Base in Fairfield, California, until leaving the military in late 1971. He joined the 132 Fighter Wing of the Iowa Air National Guard in 1982 and also served the California National Guard. In 2005, Knight was the launch supervisor for search and rescue operations after hurricane Katrina. He received a Humanitarian Award from the State of Louisiana for that service. Knight retired in 2006 as chief master sergeant. During his 32 years of service, he was deployed to Kuwait, South Korea, Japan, Germany, England and Kosovo. Knight received a Purple Heart for his actions while serving in Vietnam. His commendations also include the RVN Gallantry Cross with Palm, Republic of Vietnam Campaign Medal, Vietnam Service Medal, Iraq Campaign Medal, three Air Force Commendation Medals and two Meritorious Service Medals. Knight earned a bachelor’s degree in public administration at the UIU-Des Moines Center. He and his wife, Linda, reside in Urbandale. La’Mont Williams earned a criminology degree, with double minors in political science and history, at UIU. A wide receiver and team captain on the Peacock football team, he also served as Beta Phi Omega president, an ESL (English as a Second Language) tutor and an international ambassador. Williams furthered his studies at Loyola University Chicago School of Law from 2011-2014. A Corboy Fellow and inaugural recipient of the James P. Carey Scholarship for Trial Advocacy, he was a member of the national qualifying Thurgood Marshall Mock trial team. Williams completed an internship for the First Defense Legal Aid in 2014 and worked as an assistant program director, curriculum developer and mentoring program coordinator for another nonprofit organization called Just the Beginning Foundation. In January 2016, Williams and his brother, Nate, traveled to Flint, Michigan, to help citizens who were affected by the city’s lead-contamination crisis. The two brothers founded the nonprofit “Uniting American Communities” in response to the crisis and made up to four separate volunteer trips to the Michigan community. Williams is an associate attorney at Nyhan Bambrick Kinzie & Lowry in Chicago. The firm specializes in worker’s compensation defense, civil litigation, and federal, state and local government issues. In addition to serving as an adjunct professor and coaching mock trail at Loyola University Chicago, he is also vice president of the associate board for Just The Beginning – A Pipeline Organization, Minority Legal Education Resources, Inc., board member, and 100 Black Men of America Chicago Chapter member.